Why Buy Used When You Can Buy Certified Pre-Owned? Many people don’t understand that there are great benefits to purchasing a certified pre-owned vehicle. We want to break down the reasons why buying certified pre-owned is a fantastic option at Ray Skillman Discount Chevrolet. When people think of used cars, they may think that they are inheriting other people’s problems. Certified Pre-Owned vehicles are a great alternative to the traditional used car and come with great benefits that car owners will love. 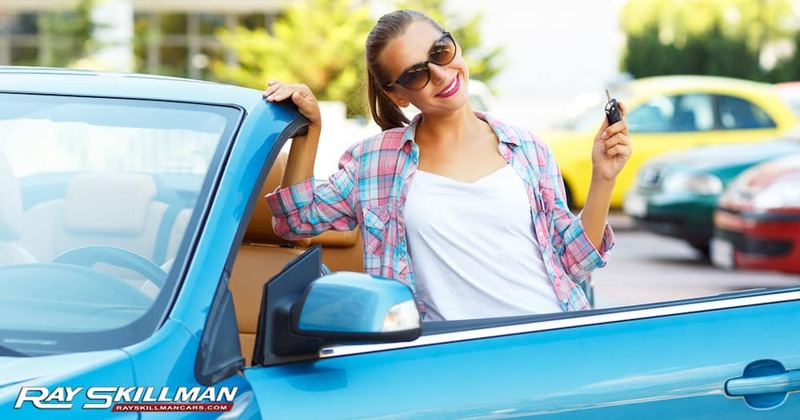 If you are looking for a car but can’t quite afford a new one, consider a Certified Pre-owned vehicle at Ray Skillman Discount Chevrolet instead. You may be thinking, why is it worth it to buy certified pre-owned instead of buying a used car? There are benefits to buying a Certified Pre-owned Chevrolet, Buick, or GMC vehicle before, during, and after the sale. Of course, we only certify the best of the best when it comes to our selection to give you more value for your money. Typically, the average certified pre-owned vehicle comes with $2,135 in built-in value that you won’t get from an average used vehicle on the lot so right away, you are getting more bang for your buck. You also get an Owner Care Program as well as a warranty to give you peace of mind. Do you want more information on the Certified advantage? Come into Ray Skillman Discount Chevrolet and talk to one of our specialists today. Not just any used vehicle can earn the Certified badge. It takes a special set of standards in order for a vehicle to become certified pre-owned. First, the vehicle must be a Chevrolet, Buick, or GMC to qualify for the Certified Pre-owned program. It must also be within 5 model years old to qualify. This is to ensure you get a newer vehicle. It must have no more than 75,000 miles to meet the Certified criteria. Next, it has to pass the rigorous 172-point Vehicle Inspection that looks for safety, mechanical, and cosmetic defects as well as the Reconditioning Process so that it is clean and ready for our customers. Certified Pre-Owned vehicles must have a clean title with no salvage, rebuilt, or branded status. We even give you a Vehicle History Report so that you know you are getting a reliable Certified Pre-Owned Vehicle. If you still have questions about this process, stop by Ray Skillman Discount Chevrolet and we will answer all of your questions. It’s great to know that you are buying a reliable vehicle that has been thoroughly inspected, but it is even better to know that the benefits don’t stop there when you buy your Certified Pre-Owned Chevrolet, Buick, or GMC. You get a 2-Year/24,000-Mile Certified Pre-Owned Scheduled Maintenance included in your purchase to keep your vehicle in tip-top shape. This includes oil change and filters, tire rotations, and multi-point inspections with a maximum of 4 service events. You also get a Bumper-To-Bumper Limited Warranty, a Powertrain Limited Warranty, Roadside Assistance, Courtesy Transportation, 3-Day/150-Mile Customer Satisfaction Guarantee, 3-Month Free Trial of OnStar Services, and 3-Month All-Access Free Trial of the SiriusXM Satellite Radio Service. Some limitations do apply to these benefits so be sure to talk to our product specialists at Ray Skillman Discount Chevrolet. All the above items are not covered for damage due to accident, misuse, alteration, insufficient or improper maintenance, or contaminated or poor-quality fuel. For complete details, refer to your Auto Warranty and Owner Assistance Information booklet.1Whichever comes first, from original in-service date. See participating dealer for limited warranty details. Buying a vehicle is a big decision, and we want to make sure that you are completely satisfied with your purchase of a Certified Pre-Owned Vehicle from Chevy, Buick, or GMC. So, if you are not completely satisfied within the first 3 days or 150 miles1 (whichever comes first) of owning your vehicle, bring it back to your dealer to exchange it for a vehicle that fits your needs.1Whichever comes first. Vehicle exchange only. See dealer for details. All vehicles equipped with OnStar hardware are eligible for 3 trial months1 of OnStar including automatic help in a crash, monthly diagnostic checks, Roadside Assistance, and Turn-by-Turn Navigation. With OnStar, you’re never far from help in a crash, or more than a button push away from finding the things you want or staying in touch with the people in your life. OnStar safely connects you in ways you never thought possible. New for the 2015 model year, complete vehicle connectivity has been taken to the next level with the introduction of OnStar 4G LTE2, which is available on most 2015 GM vehicles.1GM pre-owned vehicles equipped with OnStar hardware are eligible for 3 trial months of the OnStar Guidance Plan (excluding hands-free calling minutes). One offer per subscriber, not compatible with any other offers. Capabilities vary by model. Visit onstar.com for coverage map, details and system limitations. All of our satellite radio-equipped Certified Pre-Owned Vehicles come with three trial months1 of the SiriusXM All Access package offering all the best SiriusXM premium programming in your ride plus listening on the app and online, so you’ll hear the best SiriusXM has to offer, anywhere life takes you.With SiriusXM, you’ll have over 150 channels of everything you want to hear. In your car: Hear every channel available, including all of our premium programming. At home, on the go: Listen on the app or online – it’s included with your All Access trial subscription. Bring SiriusXM wherever life takes you, customize your listening experience, and get your favorite shows on demand. Check Out Our Tremendous Selection of Certified Pre-Owned Vehicles! Ray Skillman Discount Chevrolet is proud to offer our customers a great selection of Certified Pre-Owned Vehicles to choose from. We have a strong inventory of Chevrolet, Buick, and GMC Certified Pre-Owned cars, trucks, and SUVs for you to pick from so you won’t have to go anywhere else to find the vehicle that meets your needs. All of our Certified Pre-Owned vehicles are reliable and are backed by maintenance plans as well as a warranty so you will have more confidence in your vehicle. Get started by browsing our inventory either online or on our lot, then come see us to drive yours home today!